The 53d Weapons Evaluation Group is a United States Air Force unit that reports to the 53d Wing. It is stationed at Tyndall Air Force Base, Florida and is part of ACC. During World War II the unit, then known as the 475th Fighter Group, operated primarily in the Southwest Pacific Theater. The 475th Fighter Group was perhaps the best known of the Lockheed P-38 Lightning groups in the theater since it contained among its personnel the top scoring flying aces in the Pacific--Richard I. Bong (40 kills) and Thomas B. McGuire, Jr. (38 kills), both Medal of Honor recipients. By the war's end, no fewer than 38 other pilots from the 475th had achieved ace status while flying exclusively P-38s. The group's commander for 20 months, Colonel Charles H. MacDonald, scored 27 kills in his famous aircraft, the "Putt Putt Maru" and was the seventh-ranking American ace. The group remained in the Far East until 1949 as part of the occupation forces. From 1955 to 1956 the group was an Air Defense Command interceptor group, stationed at Minneapolis-St Paul International Airport. It was inactivated in 1958 when the United States Air Force withdrew its regular units from this civilian field. As the 475th Weapons Evaluation Group, then the 53d Weapons Evaluation Group, the group has performed its current mission at Tyndall since 1983. 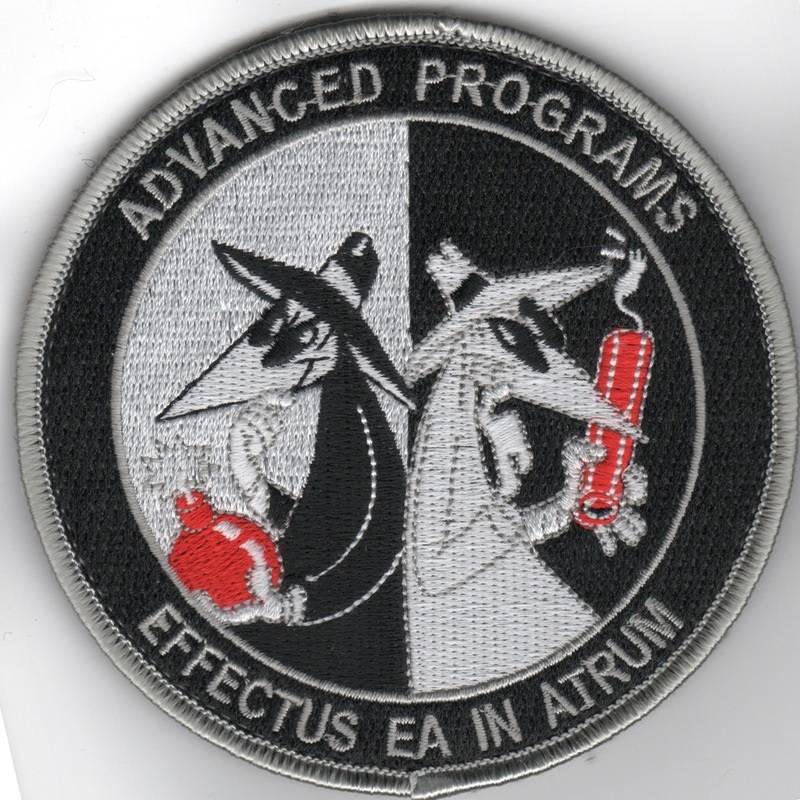 They now conduct most of the "Advanced Programs" for the USAF, as depicted in this "Spy-vs-Spy" spoof from many years ago. This patch does have velcro attached. 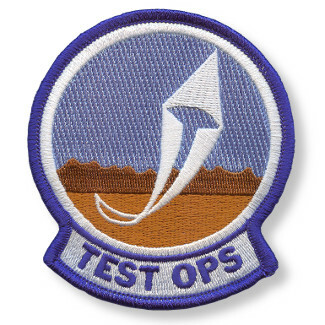 This is the squadron patch for the 59th Test & Evaluation Squadron (TES). It says "Golden Pride" across the top. This is the squadron patch for the 411th Flight Test Squadron. I don't have any other info on them, so if you know, please drop me a line. This is the squadron patch for the 412th Flight Test Squadron. I don't have any other info on them, so if you know, please drop me a line. 413 Flight Test Squadron Patch "Nutcrackers"
This is the squadron patch for the 413th Flight Test Squadron. The 413th Flight Test Squadron (413 FLTS) is part of the 96th Test Wing and is based at Duke Field, Eglin Air Force Base, Florida. It performs flight testing on C-130 Hercules, CV-22 Osprey, MH-53 Pave Low, UH-1 Iroquois, and HH-60 Pave Hawk aircraft. Check Wikipedia for their history....WOW!! This is the squadron patch for the 416th Flight Test Squadron located at Edwards AFB, CA that flew the F-16 Falcon during testing phase. This is the squadron patch for the 419th Flight Test Squadron. I don't have any other info on them, so if you know, please drop me a line. 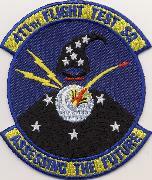 This is the squadron patch for the 445th Flight Test Squadron located at Edwards AFB, CA. They were around for years during the early years of the F-16, but decommissioned and were "absorbed" by the 416th FLTS. This is the wing crest patch for the 6510 Test Wing. Established as 412 Fighter Group (Single Engine) on 20 Nov 1943. �Activated on 29 Nov 1943.� Inactivated on 3 Jul 1946. �Redesignated as 412 Fighter Group (Air Defense) on 20 Jun 1955. ��Activated on 18 Aug 1955.� �Discontinued on 1 Apr 1960. � Redesignated as 412 Tactical Fighter Group on 31 Jul 1985 but remained inactive. �Consolidated (1 Oct 1992) with 6510 Test Wing, which was established, and activated, on 1 Mar 1978. 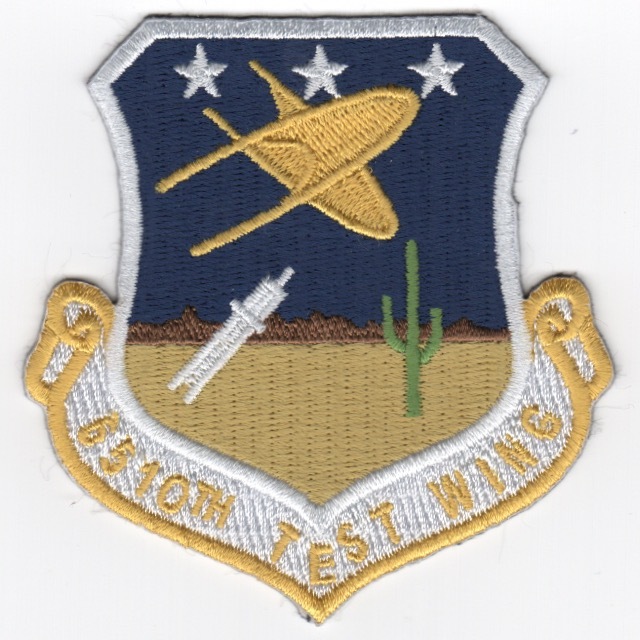 Redesignated as 412 Test Wing on 2 Oct 1992. This patch does not come with velcro attached. 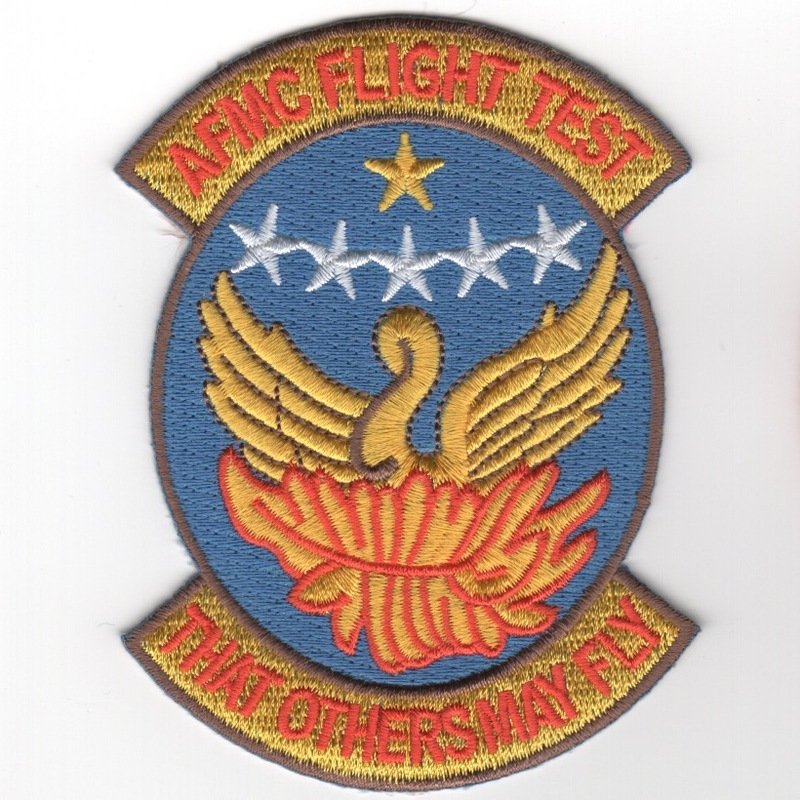 This is the 'light'-blue version of the command patch for the US Air Force Materiel Command Flight Test located at Eglin AFB, FL. This patch does not come with velcro attached. This is the 'dark'-blue version of the command patch for the US Air Force Materiel Command Flight Test located at Eglin AFB, FL. This patch does come with velcro attached. 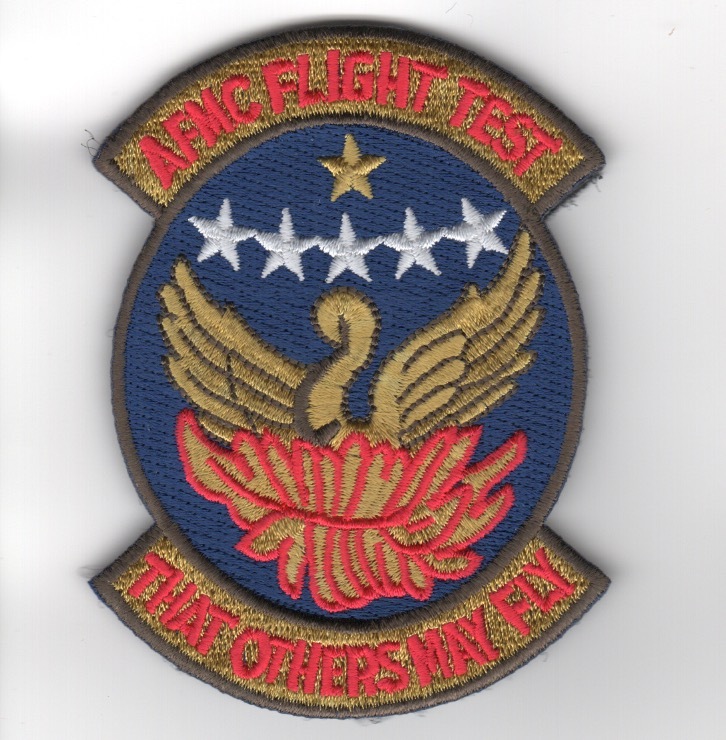 This is the 'light'-blue version of the command patch for the US Air Force Materiel Command Flight Test located at Eglin AFB, FL. This patch does come with velcro attached. Homepage | Order Misc USAF Patches!